Countdown count has been started for the launch of the satellite “IRNSS-1H” from Sriharikota this evening and the entire process is going on well. 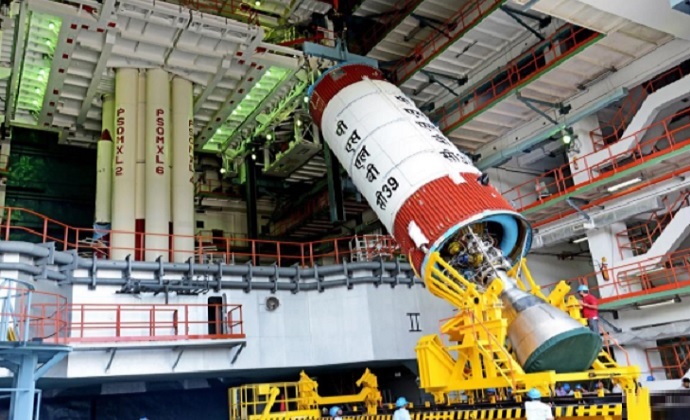 ISRO sources said that the process before the ISRO IRNSS 1H Satellite launch of 29 hours countdown started yesterday at two o’clock in the afternoon. At the moment, are busy filling scientific propellants. The “Mission Readiness Review” (MRR) committee and the ISRO IRNSS 1H Satellite launch authorization board (LAB) had approved the countdown on August 29. PSLV-C39, the launch vehicle, will use PSLV’s “XL” type for the launch of this ISRO IRNSS 1H Satellite, which has six strap-ons. Each strap-on is carrying 12 tons propellant with itself. This is the 41st flight of 44.4 meters long PSLV-C39. It will take with him a satellite weighing 1,425 kg at seven in the evening today. ISRO IRNSS 1H Satellite will be launched from the second launch pad of Sriharikota Space Port. ISRO has teamed up with a group of six small and medium enterprises to build and test this satellite. One of the seven satellites in the constellation, IRNSS-1A, will play a backup of IRNSS-1A because its three rubidium atomic clocks have stopped working. “Indian Regional Navigation Satellite System” (IRNSS) is an independent regional system developed by India in accordance with the GPS of America, GLONASS of Russia and Galileo developed by Europe. This system offers services such as earthquake and maritime shipping, disaster management, monitoring of vehicles, fleet management, shifting of hikers and for navigation and visual and audio navigators for drivers. Prime Minister Narendra Modi named it “navigator” (NAVIC Navigation with Indian Constellation). ISRO has launched seven satellites. Of these, IRNSS-1G was launched on April 28, 2016. IRNSS-1F was launched on March 10, 2016. IRNSS-1E was launched on January 20, 2016. IRNSS-1D was launched on March 28, 2015. IRNSS-1C was launched on October 16, 2014. IRNSS-1B was launched on April 4, 2014 and the IRNSS-1A was launched on July 1, 2013. According to ISRO officials, the cost of all seven satellites is Rs 1,420 crore.